Event professionals are seeking out event tracking software for many reasons including the collaborative benefits, operational efficiency, and organization. In order to save time, remain organized, and work digitally with vendor teams and clients, event professionals are choosing event tracking software. Digital planning tools like those available within AllSeated’s platform offer operational efficiency along with a collaborative environment for working with clients and vendor teams to create memorable events. AllSeated’s event tracking software offers many collaborative planning benefits including the ability to manage guest lists, create floorplans and seating charts, 2D/3D viewing, timelines, virtual reality and more. Easily track the progress and details of an event as all details are updated in realtime. With AllSeated’s floorplan tools, create floorplan diagrams to-scale. With access to AllSeated’s extensive furniture and object libraries, select the specific tables, furniture, and objects you wish to use to create the event floorplan desired. AllSeated’s floorplan tools give you the option to control the spacing between tables, the number of chairs around each table along with table numbers and table assignments. All floorplan details can be modified at any time during the planning process. 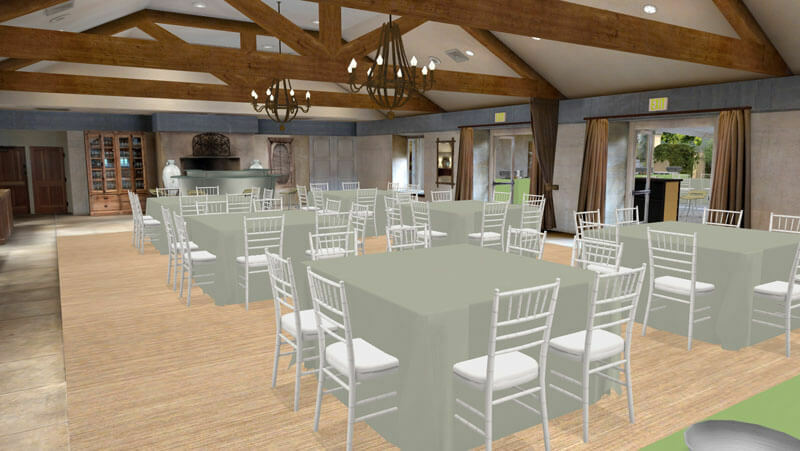 With 2D/3D floorplan viewing options, you can bring your event layout to life while still in the event planning stages. The 3D floorplan viewing features make you best-equipped to create, assess and visualize your layout to determine if changes should be made before the day of the event. Without utilizing event tracking software, the floorplan layout would not be as clear to you, making it much more difficult to visualize the end result in advance of the event. If any changes need to be made, they are usually discovered during this part of the planning stage so that they are handled in advance of the event. Within an event’s permission settings, you can provide your clients with access to manage their guest list within AllSeated. Guest names and mailing addresses can be entered and organized alphabetically and filtered into specific categories if desired. Guest names can be entered manually or imported from Facebook or Excel. Within the guest list section of AllSeated’s event tracking software provides sections for keeping notes, storing meal type requests, and track RSVP’s too. The guest list also allows for tracking guests and running reports in real time. One of the greatest features of AllSeated’s guest list is the direct link to seating. Clients can seat guests efficiently at the tables that are positioned in the event floorplan. It’s quick and simple to seat guests at the desired tables within the floorplan. There is also the option to seat guests at specific seats at specific tables too. Using event tracking software to keep track of details by generating reports. A floorplan report can detail your specific layout along with complete listing of inventory, table breakdown and seating information. A guest report can also be generated to include meal type information, table numbers and other notes that may be relevant for the venue/caterer. A guest list report can be generated to meet the needs for invitations, place cards and even for personalized favors. AllSeated’s 3D floorplan tools and virtual reality technology allow you to experience your event before it happens. Not only do 3D floorplans save you time, they provide virtual walkthroughs, eliminating the need for on-site and in-person meetings. This plays a HUGE role in the planning of events, given how busy everyone can be, as well as helping to minimize the challenges of planning destination events. AllSeated’s special Virtual Reality goggles allow you to tour a 3D floorplan in a realistic simulation. Learn more about AllSeated’s VR in this video along with the 3 easy steps for getting started here. AllSeated’s latest VR technology is the event industry’s first/only genuine virtual reality capability offering seamless 3D renderings, sending customers on a virtual walkthrough of a venue from anywhere in the world. Visitors can tour a venue in 360 degrees to achieve photorealistic immersion into a venue months before their event takes place. Learn more about AllSeated’s VR in this video! With floorplan diagrams designed to scale, 3D viewing options, and virtual walkthrough capabilities at your fingertips when using event tracking software, you are best equipped to design your event floorplan layouts accurately, leaving less chance for error on the day of an event.